I still remember Paul’s Levin staring back at me the when I looked through the eyepiece of my camera for the first time a couple of years back. 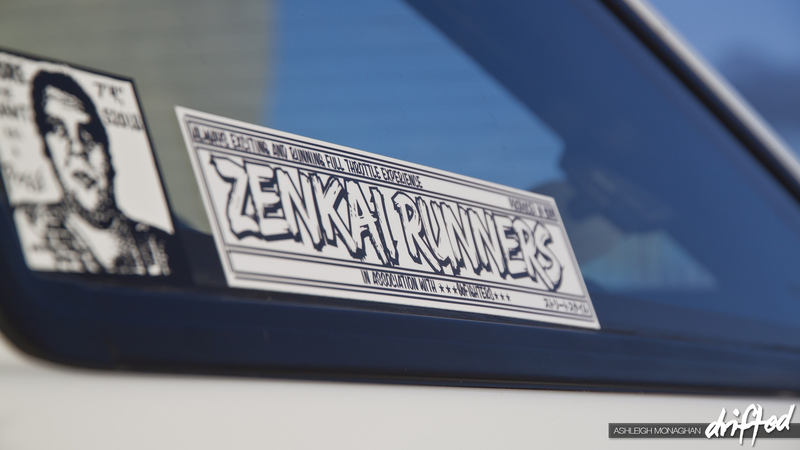 Naive and unaware of my automotive hobby, I thought to myself “this is one seriously cool ride”. 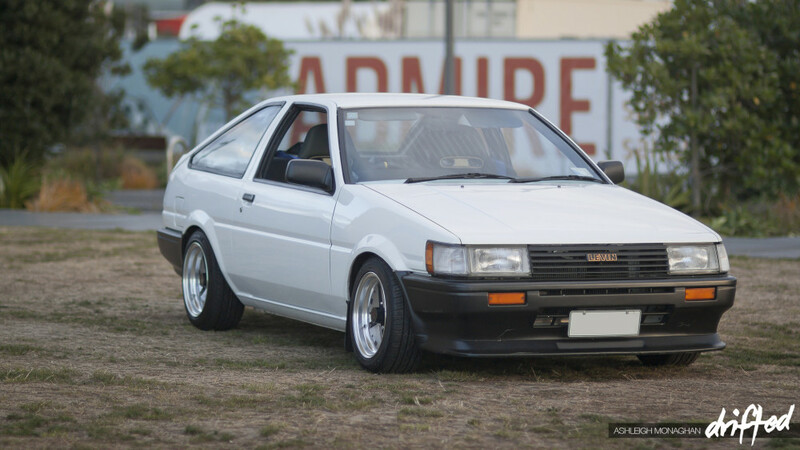 As per usual in the New Zealand car scene, not all vehicles are as they seem; with an AE111 heart and AE86 driveline, this particular Levin was not your typical (excuse my pun) Black and White ’85. As our friendship grew and I began to learn more about the global drifting scene, I also became much more familiar with Paul’s car. 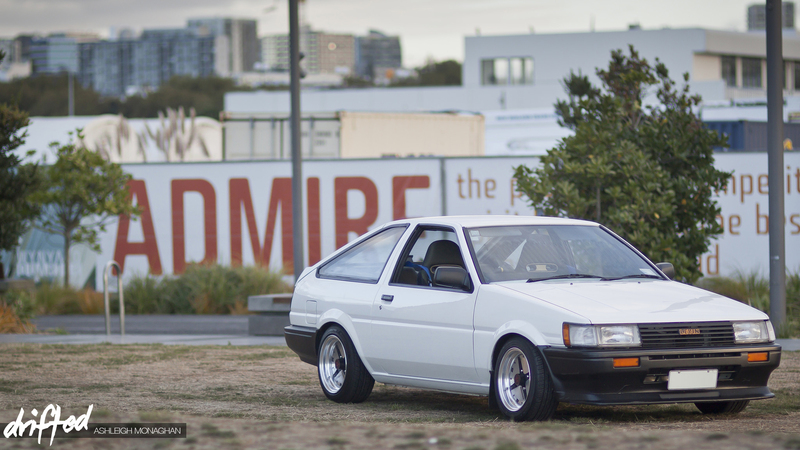 Dumbfounded over how much he has spent on paint and genuine Toyota panels during his near decade of ownership, I knew that this car was a game changer for the NZ Hachi community. 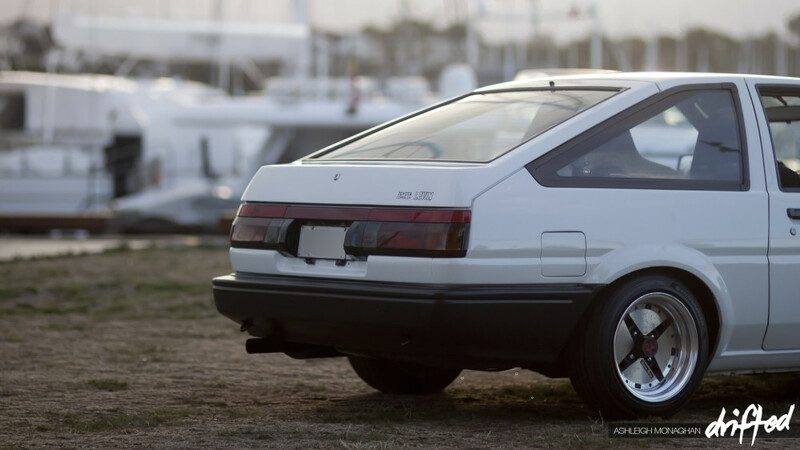 I have personally seen the ’85 on several sets of wheels however none are as well matched to the car as his newly acquired 14″ Impul G5s. Before even deciding to shoot his car down on Auckland’s waterfront Paul had encouraged me to take the wheel for the evening. I was wary at first and had even said no to the initial drive down to the location, but after a bit of convincing from him I decided to give it a go. After owning a naturally aspirated and short wheel-based car myself, I surprisingly felt more than comfortable behind the wheel of the Levin. 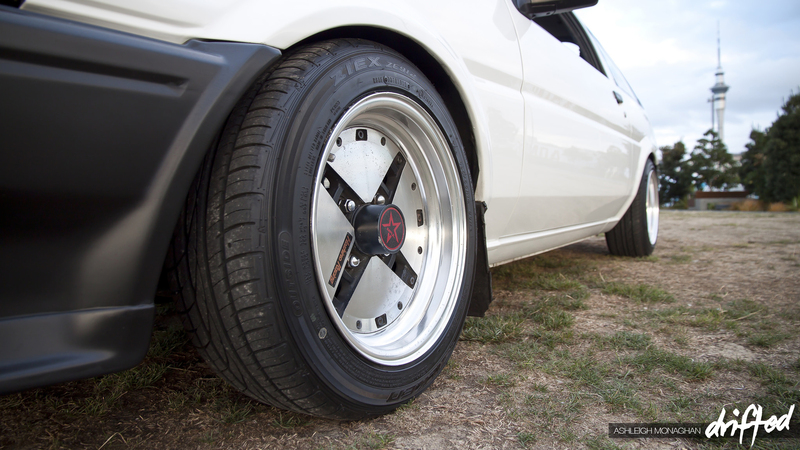 Seamless gear changes and clean acceleration complimented the quality of Paul’s build. Despite the hellacious noise of the quad throttles, the mixture of a 20 valve blacktop with the safety of a 1.5 way LSD could only mean one thing; this car is perfect for the track, yet reliable and safe for daily use on the street. With the interior dash in immaculate condition and free from any unwanted rattles, the 85 is a perfect combination of both classic style and modern comfort. What really caught my attention was the recently upgraded Honda Euro R Accord seats that Paul had fitted. I was convinced. “Have you ever considered what price you would sell this for?” I asked. His response? “I don’t want to create a cash figure for a car I don’t ever plan on selling”. 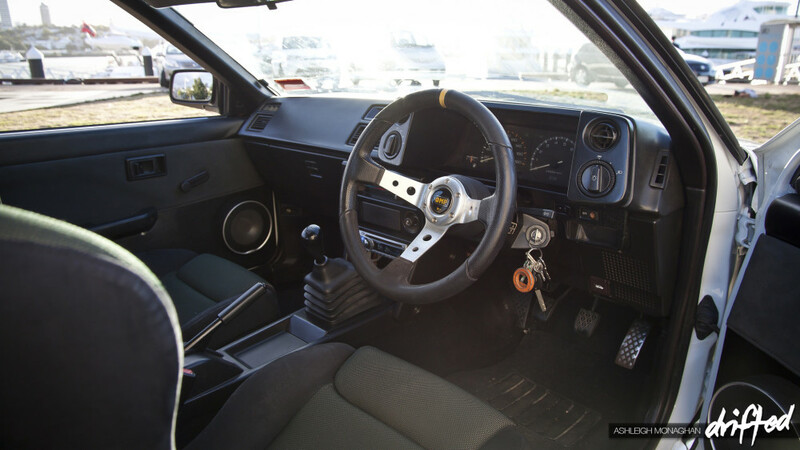 After returning to the wheel, Paul explained a couple more modifications he had completed in the past – such as his original AE85 to AE86 engine conversion, previous to the more recent AE111. 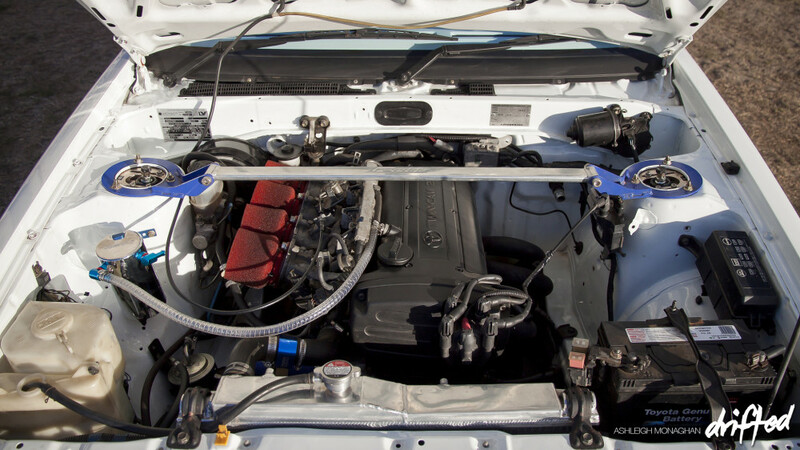 When the call was made to convert the Levin for the second time it was decided that keeping the firewall unmodified was non-negotiable, consequenting in a combination of fabricated and purchased modifications to ensure that the new blacktop engine was able to run a stock ECU and ignition system. It is certainly easy to see why Paul would rather share his efforts with the streets of Auckland City, rather than one of the few drift sections in the country. Dedication and effort were two words that came to mind as I looked down my eyepiece at Paul’s Levin just a couple of days ago. Resisting the temptation to sell his project and move onto another has resulted in a beautifully evolving ‘85 that is forever changing alongside Paul’s tastes. I hope to see much more from Paul and his car in the future, both on and off the street, and I am excited to see what may be lined up next for this little black and white beauty.